The Haloform Reaction is a very specific type of alpha halogenation reaction. This reaction takes place at the methyl ketone turning the methyl into a good haloform leaving group. This can include chloroform and bromoform, and of course the Iodoform solid precipitate used in lab to test for the presence of a methyl ketone. 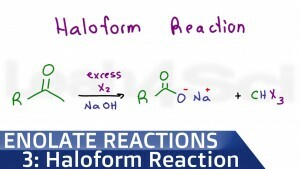 The video below shows the reaction and mechanism for haloform reaction and the iodoform test.